While I was pregnant, it always struck me that you hear about the more dramatic and often unpleasant experiences of labour and birth, but not so often the fairly straightforward! Neil and I attended the NCT antenatal classes, partly to meet other mums and dads due around the same time, but also for reassurance. I felt that I had experienced quite a few babies being the eldest cousin of the family with a fourteen year gap, and had even acted as birthing partner for my Auntie's little boy back in 2003, so I was fairly confident I knew a bit about it. I come from a fairly scientific background at school as well so knew a lot of the jargon that the midwives were using. Neil had not had much experience with babies and it was our first pregnancy, so we both needed some guidance and support. Over all, I had a textbook pregnancy, apart from developing SPD (pelvic girdle pain) towards the end, which made walking extremely painful. I loved my bump and the feeling of closeness I had with whoever was inside. But I was nervous about labour, the inevitability of it particularly, like an unstoppable train. I thought I would never be able to have learnt enough in time and I would panic when it started, or not know when to go to hospital etc. The weekend before I gave birth, we visited the birthing unit, where we ended up delivering. We were both really impressed with the facilities and the friendliness of the midwives we met there. I was pretty sure labour was close as my Braxton Hicks contractions were increasing. Sure enough, on the Monday afternoon around 5pm I realised they were regular contractions but they weren't painful. Instead of the panic I had been expecting, I felt an immediate sense of calm. I spent the evening on my birthing ball, having dinner and playing games with my husband and my parents, who were all much more nervous and excited than me. I phoned the birthing unit at midnight to let them know I was in labour and went to bed for a couple of hours. The contractions were by now regular and long but still not painful, just uncomfortable. By 3.30am they were coming very close together so I decided it was time to go to the birthing unit. The midwife who examined me was amazed that I was already 5cm as I was so calm. I had always expected to be scared and very vocal in labour so I was just as surprised. I felt utterly calm and prepared. I was filled with determination and focus. Both my Mum and her Mum had done this with no interventions, so I could too. I found that a particularly powerful thought to urge me on. I was offered the birthing pool, which I stayed in until around 8am, but I think it slowed things down as I was only 7cm when I came out. The midwives had changed over at this point and a new fresh-faced and wonderful student midwife appeared. I had to tell her each time I had a contraction as my way of getting through them was to be very quiet. I was reminded that it was ok to shout or swear, but I knew it wouldn't be helpful. We were shown to a much brighter, more comfortable room with lots of windows and a birthing stool. The midwife had to break my waters at midday and that made my contractions kick up a gear. I tried out some gas and air at this point and used the suspended rope above the stool for support. The gas and air didn't take away the pain but it made the time go fast and made me laugh and cry uncontrollably. I stopped using it after a couple of hours and got up to sit on a bed to start pushing as my arms were knackered. I had my mum holding my left hand and my husband holding my right. They were both so supportive and I'm glad they were both there. The actual birth seemed really quick to me but probably took about an hour. I was allowed to feel her head as she crowned, which utterly spurred me on, and she came out after a couple of pushes and was placed straight on me. Nothing can describe that feeling accurately. All the pressure and pain vanished instantly and was replaced by utter bliss and overwhelming love. She was so perfect. She was sporting a lovely crop of thick, dark hair and beautiful grey eyes, just like her Daddy. Neil was able to tell me we had a girl, and then got to cut her cord. 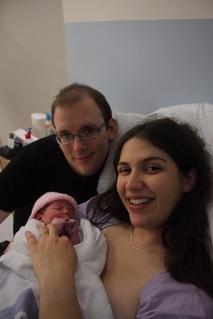 Amelia was born at 3.26pm on 15th November 2011, and weighed in at exactly 7lbs. I managed to have a natural third stage and delivered the placenta about an hour later after much stubbornness on my part. I was angry and upset at the thought of needing a catheter after getting so far without any interventions! We were back home by 8.30pm that night with our little girl in our own bed. 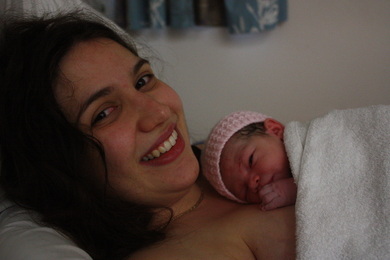 It couldn't have been more like having a home birth, except I knew I was in safe hands.